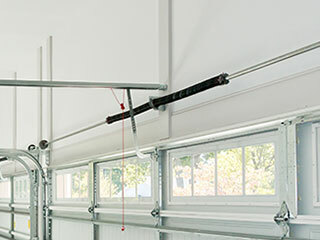 Without functioning springs, your garage door won't be able to move. Your door’s opener is reliant on the springs to allow smooth and safe movement; the springs are responsible for bearing the tension as the door opens, and then gently lowering it during the closing process. One thing is clear, both your springs will wear out over time, and if either one fails, it’s a good idea to get it replaced quickly. If your springs need replacing or attention, contact our team today - we’ll set up an emergency appointment to get your problem solved ASAP. A broken spring is usually obvious enough to identify, but how can you tell if one’s about to break? It’s not that easy - there are often a few key warning signs. As the springs get weaker, the door will often sag or sway as it moves. This is a sign that they’re near breaking point, and need professional attention as quickly as possible. Will My Springs Need Replacing? If your door springs are anywhere near failing completely, they will need to be replaced. However, some amount of wear can be compensated for by adjusting the spring tension. Check the balance of your door by opening it halfway and disconnecting the opener. If the door falls noticeably, the springs will need to be tightened or replaced - get in touch with our technicians. How Long Do Springs Last For? Cheap springs will wear out faster than high-quality ones, and regular maintenance can extend the life of either type. You should expect your springs to last somewhere between 3 and 10 years, depending on their quality, how often your door gets used, and the frequency of maintenance. Don’t try and work on these components yourself. They’re under a lot of tension, and installing a new set is very difficult to do safely without the proper tools and training. It’s much better to arrange an appointment with our team than run the risk of injuring yourself by attempting installation without our help. Don’t run the risk of letting your springs wear out. Schedule a service with our technicians to assess whether you need a new set of springs - get in touch today to set up an appointment.